The sensors will be used in monitoring coliform level of the water while the CCTVs will help apprehend people littering in the area. The Philippine Government will be utilising tools such as monitoring sensors and CCTVs in its bid to win the ‘Battle for Manila Bay’. According to a recent press release, these tools will be at the government’s disposal to be used for their Manila Bay clean up initiative. The project, to be headed by the Department of Environment and Natural Resources (DENR), was launched recently to kick-off the efforts from various government and non-government volunteers in rehabilitating the Manila Bay. Department of Information and Communications Technology Acting Secretary Eliseo M. Rio, Jr said that the sensors will be used in monitoring coliform level of the water. The coliform level is targeted to be reduced from its current state of around 300 million mpn (most probable number per 100 millilitres) to 100 mpn in an attempt to make the waters swimmable again. The Department can contribute in lowering the level by installing several sensors in the area so that the coliform level can be monitored by the Office of the DENR Secretary Roy A. Cimatu. Moreover, a number of establishments around the bay, which are believed to be generating and discharging ‘pollutive’ waste water, have been ordered closed to stop further pollution. In addition, as a form of preventive strategy, the Department commits to install CCTV cameras along the area to help them apprehend people dumping trash straight onto the water. These CCTV cameras are going to be connected to the command and control systems of the Department of Interior and Local Government (DILG). The significance of the connectivity that the Department is providing should be highlighted as this would allow the information to reach systems of both the DILG and of the Philippine National Police (PNP). 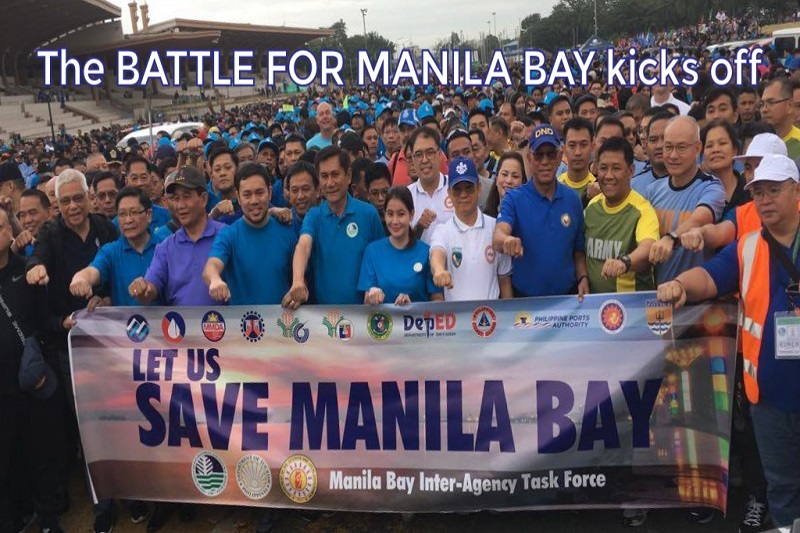 The ‘Battle for Manila Bay’ is the first of a series of clean-up and rehabilitation activities that would be done simultaneously along the whole coast area including parts of Navotas, Bulacan, Bataan, Pampanga and Las Piñas. According to the DENR, the government estimated around US$ 798.38 million (PHP 42 billion) as initial funding for the rehabilitation. As reported, it will bring together more than 5,000 participants, mostly personnel from the DENR and 12 other government agencies tasked by the Supreme Court to clean up and rehabilitate Manila Bay in 2008. Other government agencies that are also taking part in the rehabilitation are the Department of Tourism, the Department of Social Welfare and Development (DSWD), the Department of Trade and Industry (DTI), the Department of National Defence (DND), and the Department of Science and Technology (DOST). The rehabilitation will be undertaken in phases over a period of an estimated seven years.